Today is the big day. It’s been written on our family calendar for months. It’s a day of anticipation and dread. It’s the first day of school. As a Stay At Home Dad it means the return of taxi driver to my daily routine. As well as alarm clock and lunch-preparer for my kids. Today is a day that I both dread and celebrate, but not for the reasons many parents do. 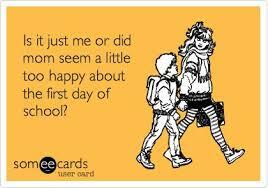 As a former student (a long time ago) and former teacher (not as long ago) I loved the first day of school. There was a sense of optimism and possibility and freshness. A new year with a new teacher and mix of old and new friends. Getting to see friends and colleagues again after the summer break. It almost made the chore of getting everything ready worth it. Almost. After all, it was still school. It also meant the end of staying up late and sleeping in. Playing at the park, hiking at Mt. Rainier, going to week-long camp, and vacationing in Europe, to name a few. Doing nothing and enjoying it. Replaced by getting up early (rude alarm clock) and homework or lesson planning and correcting papers. What I don’t understand, though, are the parents who are celebrating that their kids are finally out of their hair. Fruit of the Loom (makers of fine underwear) even started a #TGIBTS (Thank Goodness It’s Back To School) campaign to capitalize on this sentiment among parents (although it was aimed at moms). It makes me sad that there are some moms and dads who genuinely celebrate the absence of their kids. I’m going to miss my kids while they’re at school. It’s going to be quiet(er) with only a four year old and one year old at home all day long. What ever will I do with all of my newly-found free time? HA HA HA! As much as the teasing and such between my kids is a little bit annoying, I love having them at home. They bring so much joy to my life on a daily basis. I’m going to miss the fun that we have just doing life together. Yet, I love that they get to go and learn and be with friends and teachers and experience things that I cannot give them. I loved being a student (even though at times I had to work hard) and had a lot of fun in school. While I wasn’t a fan of the significant homework and studying in high school and college I understood it to be a part of my “job” as a student. I hope that my kids will view their educational opportunity in the same way. If anything, I celebrate the new and fun things that my kids will learn this coming year. The only bit of dread that I have is in wishing I had done more with my kids during their time off. Did we do enough fun stuff to make up for the days where we did basically nothing? Did they get to do something memorable enough that they can write about it for their first assignment in English class? Will they look back on their Summer 2014 as fondly as I do? I hope that they each can answer yes to all those questions. But, in the minds of my kids, I’m sure they’re probably already starting the countdown. 180 school days to go. June 11, 2015 can’t come soon enough.